SRAM’s new eTap AXS has not been out long, but it’s already been hacked. At Dwars Door Vlaanderen, Trek-Segafredo team leader Jasper Stuyven rode a Trek Madone Disc with Shimano Di2 sprint shifters wired into his eTap AXS drivetrain. He also had SRAM’s eTap Blips shift buttons installed on the tops of his handlebars, making for an intriguing mash-up of shifting components. Both Shimano and SRAM have satellite shifters for their respective electronic groups, but they are substantially different in design. Shimano has two types of satellite shifters. The sprint shifters are little buttons with triangular covers that typically mount in the drops for shifting with the thumbs. (There are also separate sprint models for mechanical- and hydraulic-brake Di2 groups, with the latter having a wider triangular cover.) Then there are climbing switches, which are typically glued or zip-tied to the tops of the handlebar next to the stem and feature two big buttons. 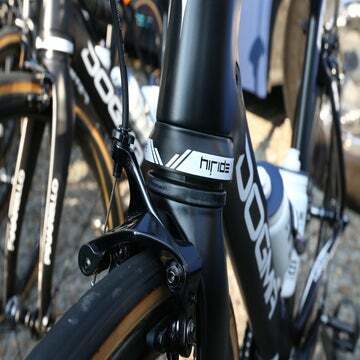 All of Shimano’s Di2 electronic pieces are wired. SRAM has one type of satellite shifter, the Blip. It is is a big button that is wired into the shifter lever, which in turn communicates wirelessly with the derailleurs. Riders typically run the Blips on the tops of the handlebars, on either side of the stem. Although the Blips, like sprint shifters, can be set wherever riders like, at least within the reach of the wire. Unlike the Di2 sprint shifter that can be easily (sometimes too easily) clicked with an indirect or direct nudge of a finger from the top or the side, the Blip can only be engaged with a firm, direct press, like on an elevator button, as a hard cylinder encircles the button. 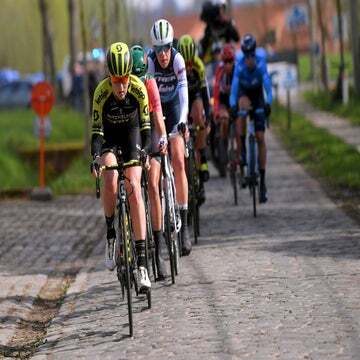 Stuyven went on to finish 14th in Wednesday’s race to Waregem, Belgium. Some of Stuyven’s teammates like Koen De Kort use Blip shifters under their handlebar tape, in the drops. This is De Kort’s bike below. All the other photos are of Stuyven’s bike, including the image of the glued-on Blips above.